The serve is the most important shot in tennis. It gets the point started, and with a solid, consistent serve, you can dominate your matches. However, with a weak serve, you're prone to be broken on your service games and that puts you on the back foot in matches. For recreational players, the serve can be confusing and difficult to master. It is one of the most technical movements in all sports and requires patience and repetition. These 5 tips today are the basics and fundamentals that you build from. Focus on one at a time and practice, practice, practice! Tennis Tip 1 - Get a Grip! Use the continental grip for a serve. That is grip number 2, with the index knuckle on the top right bevel. This is often uncomfortable and difficult until you become used to the grip. The use of correct technique and pronation with get the most out of the continental grip. For kids and adults starting out it is ok to use the eastern forehand grip, number 3. The most difficult element to master consistently is putting the ball where it needs to be. Use a straight arm, let go of the ball at about eye height and continue the arm so it's pointing at the contact point. Aim to put the ball at 1 o'clock, that is, slightly in front of you and slightly to the right. As you lift your arm for the ball toss, lean your hips forward under the ball and bend your knees. This helps with balance, stability and power. 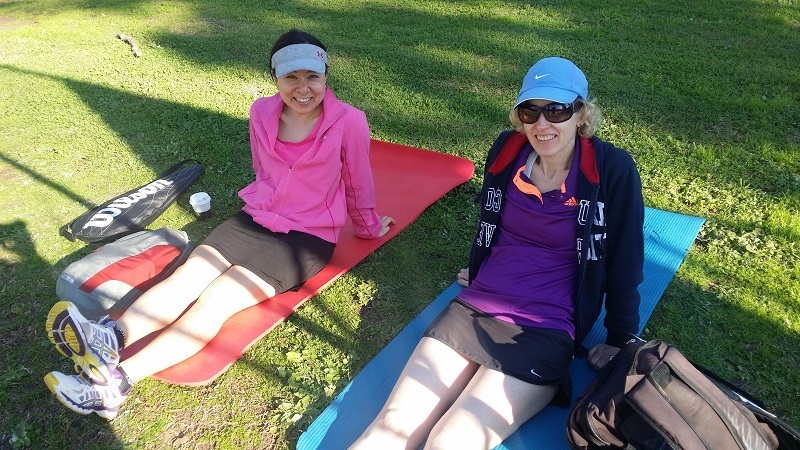 Tennis Tip 4 - Where do you finish? Move up and forwards into the contact of the ball. You should finish into the court after hitting the serve. If you're finishing sideways or backwards, not over the baseline, your ball toss is incorrect and/or you're hitting the ball in the incorrect place. Once you've swung your arms and turned your shoulders through the contact of the ball, they need to continue and finish to the left of your body. Making sure you have a clean follow through and trajectory of the swing will ensure the ball will go where you want it to. Once the follow through is made, take a further step to push back into the recovery position and split step, ready for the next ball. Remember to drill these aspects of your serve, you want them to become muscle memory so you don't need to think about them in a match. You want to think about where you're going to hit the ball and place your next ball. Following on with our new 5 Tennis Tips feature to the Four Seasons Tennis Blog, today's new 5 tips are focused on the volley and net game. A new feature to the Four Seasons Tennis Blog, we’ll be putting up 5 new tennis tips each month to help better your game. 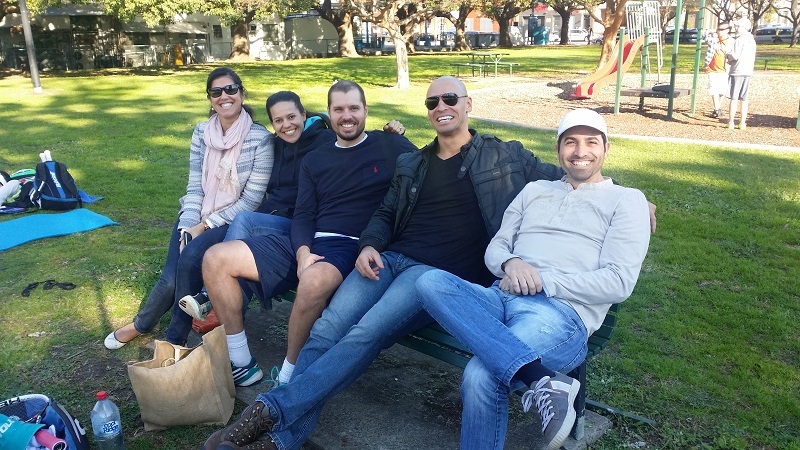 They are mostly tailored to recreational players wanting to get the fundamentals of tennis right. Aim to land your split step a moment after your opponent hits the ball. You want to be at the height of the jump when they contact the ball, then land in the split momentarily afterwards. This timing can be tricky at first but will help you with the momentum to move into position for the shot to come. Rafael Nadal doing a split step before hitting his trademark forehand. When throwing the ball for the serve, start bending your knees when the throwing arm starts rising. You should get to the lowest part of the bend when the ball reaches its peak then drive upwards to start hitting the ball. Notice Pete Sampras’ smooth knee bend on the serve, one of the greatest ever! The Sampras and Federer serves are things of beauty! Once you’ve hit a groundstroke, forehand or backhand, and are recovering back into position, push off with the outside leg and crossover before side-stepping and doing the split step. This is a fast and balanced way to recover. Watch Nishikori crossover his steps after a winning forehand. Watch Andy Murray practice movement and footwork. Notice the crossover steps. As soon as you know you’re hitting a forehand or backhand, turn your torso to the hitting side and watch the ball come from over your shoulder. This unit turn of the upper body will generate power as you turn back into the contact point and will help with balance. Your shoulders shouldn’t face the net all the time. Serena Williams shoulder turn before massive forehand. Wawrinka shoulder turn for both forehand and backhand. Ideally, when you close the net for the volley you want to contact the ball above the net height. This gives you more angles to put the ball away and force the opponent to hit a ball from below the net height. Pat Rafter hitting a volley above the net height, then Rafter digging out a low volley. Next month there will be 5 more tips to work on. Keep on training! Monday was finals night for the Monday evening competition bringing yet another competition to the end. 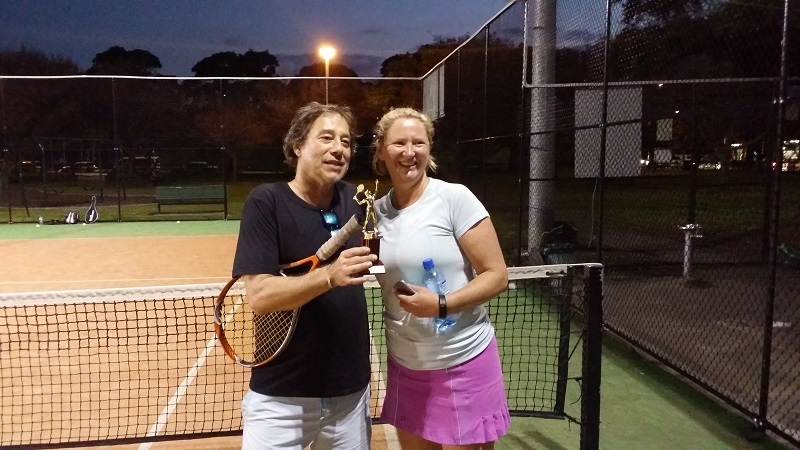 Our Monday evening tennis competition run across 7 courts at Marrickville District Hardcourts and has 2 divisions. Division 1 is for advanced players and division 2 is for intermediate. 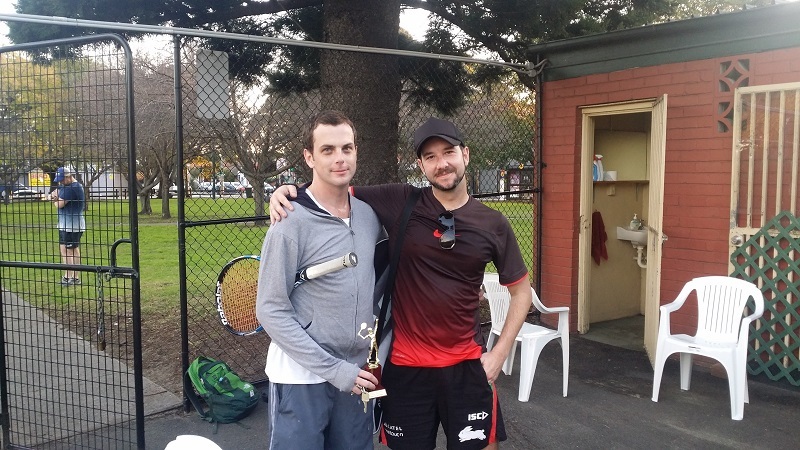 Teams consist of 2 players who play 2 sets of doubles and 1 set of singles to score as many games as possible. 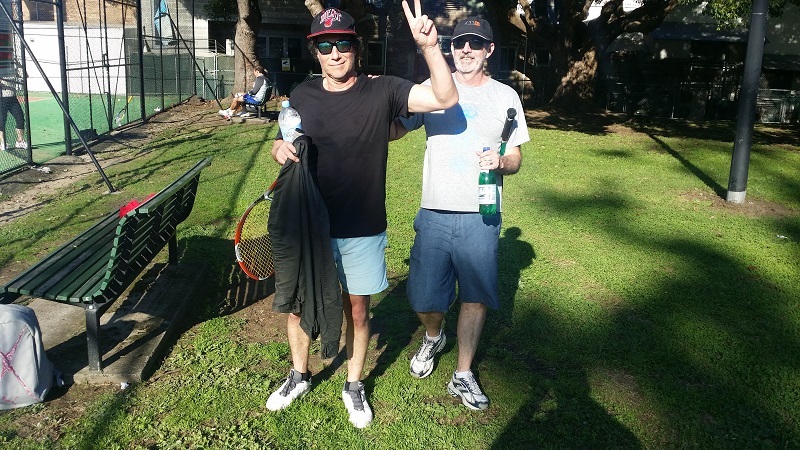 Our winners for Division 1 were Tabone/Butijer. 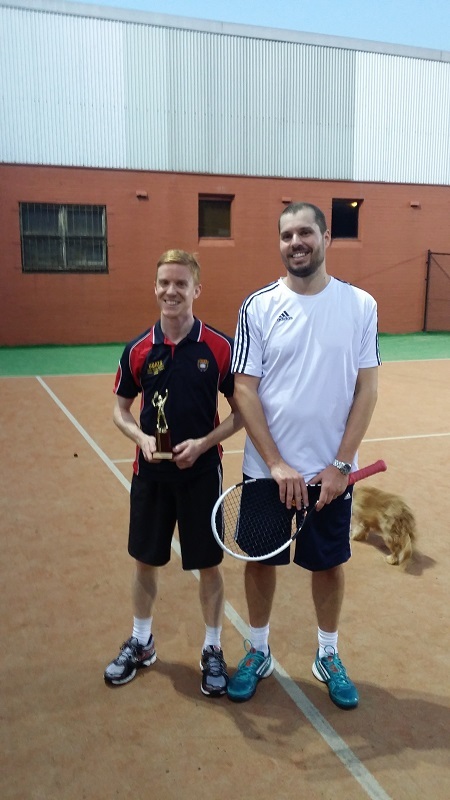 Division 2 winners were Wilson/Jackson. The next Monday night competition start 17th September, next week! Register or get more information here. Especially during the warmer months, this competition maintains a lot of the same players so if you're interested please reserve your place. Normally bookings are small during winter, but this tournament had great numbers. The kids were split 2 divisions and split again into 2 pools of 5. Each pool played a round robin and the top 2-point scorers when on to play semi-finals. Player 1 played player 2 from the other pool and vice versa. We play the round robin in fast 4’s format (excluding the let rule), then full sets for semi-finals and finals. George N. vs. Leo Ca. Angus B. vs. Raymond T.
Mandela D. vs. Oscar L.
Leo Co. vs. Amitesh S.
Both Angus and Mandela lost their titles last tournament but were able to reclaim them this time in hard fought battles. There was a definite improvement in their mental games under pressure which got them over the line. A big thank you to all the players who participated and parents for their support. Here are the results and photos of the tournament. I'll put more photos on the facebook page. With torrential rain on Saturday and Monday either side of the tournament, we were lucky for such a wonderful day. All matches went off without a hitch with some great match-ups. The next tournament will be 25th March 2018. Make your booking here. We also run 4 weekly competitions a year. Check them out here. If you have a hitting partner or someone to practice with and want some variety and direction, try the 3 drills following. First up if you missed Part 1 check out the Hitting Partner Drills click here. This drill is one of my favourites to do but also to watch how players hangle it. Figure 8's teaches recovery, timing, shot selection, fitness, and brutal toughness to just keep going and retrieve one more ball! The drill is very difficult to do well and takes a lot of practice. Your heart rate will shoot up within a couple of minutes so stagger the drill timing. Maybe 4-10 rallies then 30 sec rest. 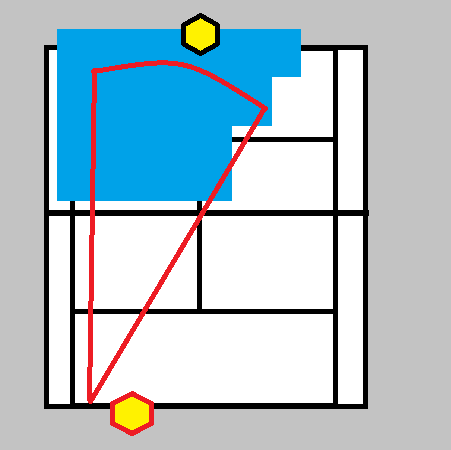 Using the full singles court Player A can only hit down the line (DTL) and player B can only hit crosscourt (CC). The result is the ball does figure 8’s around the court. Practice hitting CC and DTL for 10-15 minutes each. Start by rallying the ball and setting goals of how many rotations you can get. Every 4 balls equal 1 rotation. Start slow, aim for 3-4 rotations and build up from there. As your consistency improves you want to be getting 6-10 rotations more often than not. This will build stamina, fitness and consistency. Same format of drill however you play the point out. If you’re hitting DTL the ball must bounce in that zone otherwise it’s out. Score mini sets of first to 11 then swap shots CC with DTL. 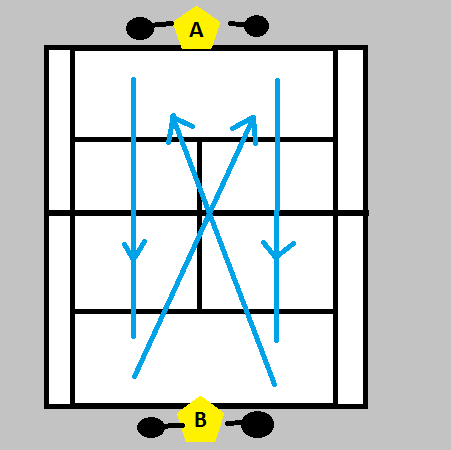 The same progressions and formats can be played with the baseline/ground stroker vs volleyer. The baseline player will have to work overtime. It’s a dog eat dog world and a simple rule in tennis is play your strengths against your opponents weaknesses. That’s what I want you to think about with this drill. 90% of tennis players have a stronger forehand (FH) than backhand (BH). Most players work this out pretty quickly about their opponent and of course hit most balls there during a match. This drill is all about that scenario. That means hit it to your opponents BH as much as possible. If they start waiting on the BH side too much play to the FH to keep them honest. This will help open up the court for the next shot anyway. You want to be looking for the FH. Any balls in the middle of the court or you think you can run around, do it! If want practice getting the feet around balls, playing the off FH, inside out and inside in FH. Become the aggressor and force them to play BHs all day long, but remember they’ll be doing the same to you. In the diagram, you can see when you play a deep shot to the opponents BH, if their return isn’t deep/wide enough back you can it a FH. Work on your anticipation and have fast feet. The area in blue is where you should be able to hit a FH if you want. This is the key for BH defence is to hit it the ball early and out in front. If you can’t do that there is no hope of hitting a decent crosscourt ball and you’ll be giving the opponent a FH. Any late BHs are likely to be in the hitting zone shown in red. When you get around the ball and are able to play a forehand, instead of being able to play it anywhere, it must be played DTL. The first is you have to set yourself up to be able to hit FH they’ll struggle to get to. If the opponent is already standing in the middle of the court when you hit the DTL it’s an easy CC shot for them and you’re immediately on the back foot, playing a BH. You set it up by pulling the opponent wide on that BH, try to get their feet past the singles line, and then pounce on the FH DTL. PAD is played full court singles, one on one. You need to call a word before you contact a ball describing what kind of shot you’re playing. 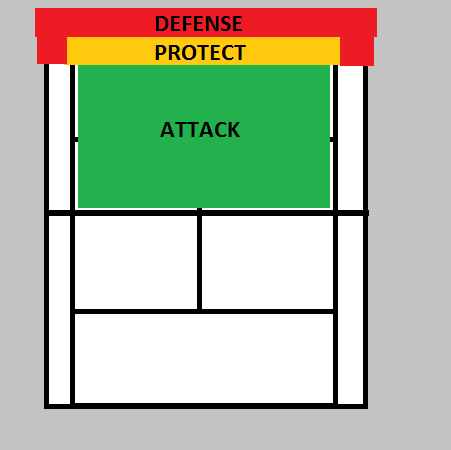 You can use Protect (Orange), Attack (Green) or DEfence (Red). Some prefer to say colours in this drill. In the diagram below, you can see the general areas r what shot needs to be played. The RED AREA is generally the defencive zone. Often you pulled out wide or playing balls off the back foot. When playing from these areas give yourself time to get back into position by giving the ball clearance over the net and slow the ball down by using spin. The ORANGE AREA if the neutral zone. You might come up with some strong hots from here but in all likelihood the opponent will be able to retrieve most returns. Stay in the rally from here by hitting deep and making the opponent play at least an Orange or Red ball. THe GREEN AREA is the attack zone. If you’re pulled into the court you have to do something with this ball. you bodyweight is already moving forwards into the shot so take advantage. Remember the closer you get to the net the more angles you can play. If you pay an Attack shot, you want to opponent to return with a defencive shot. If you play Attack and they are able to play a neutral ball, the point can quickly change momentum and you’ll be playing a defensive shot. From the defensive position you want to force the opponent to play a neutral ball by hitting deep. Don’t go for an all or nothing hero winner from off the court. PLay a percentage shot to stay in the rally. Once you have the hang of it, add some points into the drill. You can win a point by saying Attack before hitting the shot. However, if you say attack and make an unforced error, the opponent get the point. If you win the point on neutral or defence it doesn’t count. This make you think before pulling the trigger. Too many players attack at the wrong time or change their technique on the attack shot. This leads to unforced errors. A winner or true attack shot is when you notice to opponent is out of position or on the defence, and you capitalize. These drills will boost your game if practiced regularly with your hitting partner. Our coaches do these drills and many of the same caliber during private lessons and adaptations for our group classes. There are many variations for each of the drills above. This is a starting point but you can change rules or goal to suit your needs. 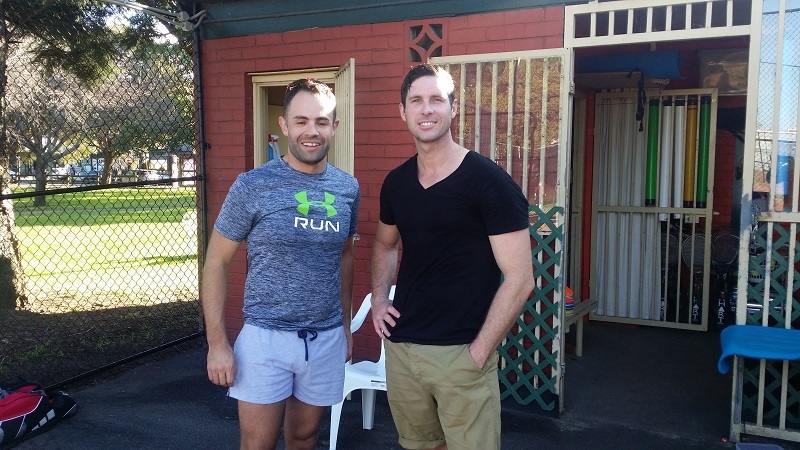 Remember you want to be specific with your training and keep progressing. Don't just hit full court for an hour and call it a training session. 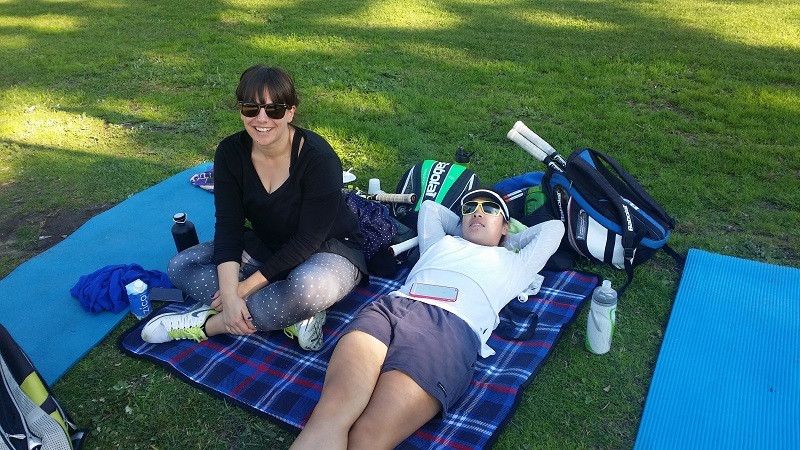 Click here if you’re interested in private lessons at Four Seasons Tennis or if want to check out our coaches out beforehand here they are. 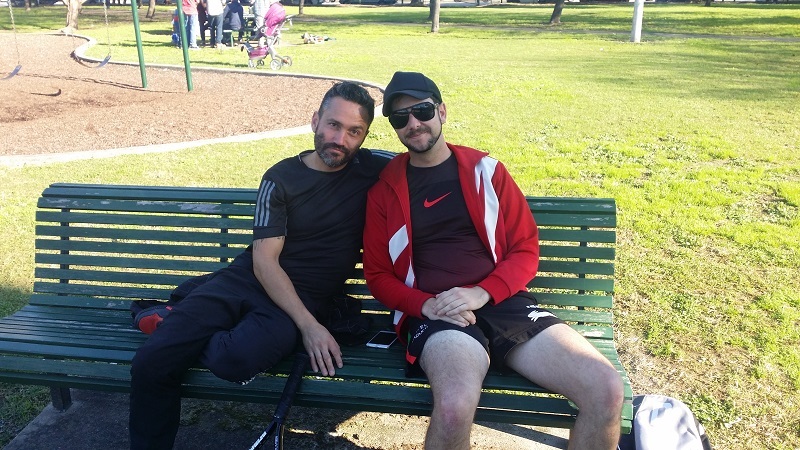 What a wonderful day of tennis we had. There was a huge improvment from everyone who participated in the competition. Huge lengthy rallies were great to see and everyone really going for their shots. So many matches right down to the wire. 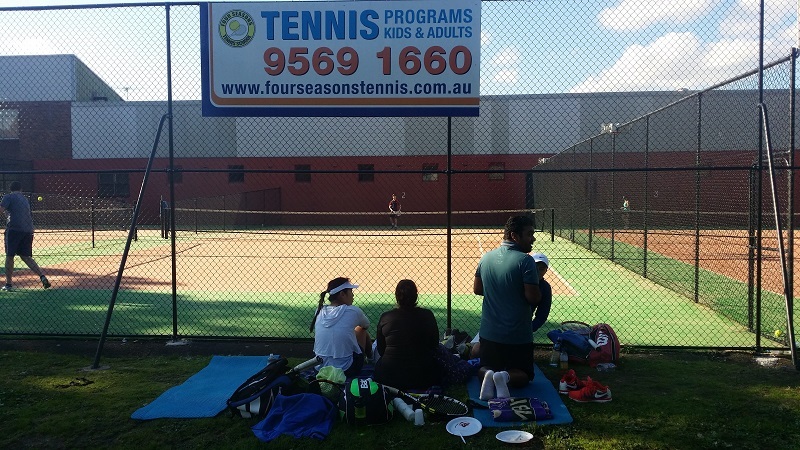 Everyone who attended were members of our junior tennis coaching school. It was great to see the kids putting the things they've learnt in the lessons into practice in a competitive setting. We had 2 divisions in the tournament, both very strong. The division 1 finalists were the same as last time! Again than you to everyone who participated in the tournament and we hope you can join us next time. 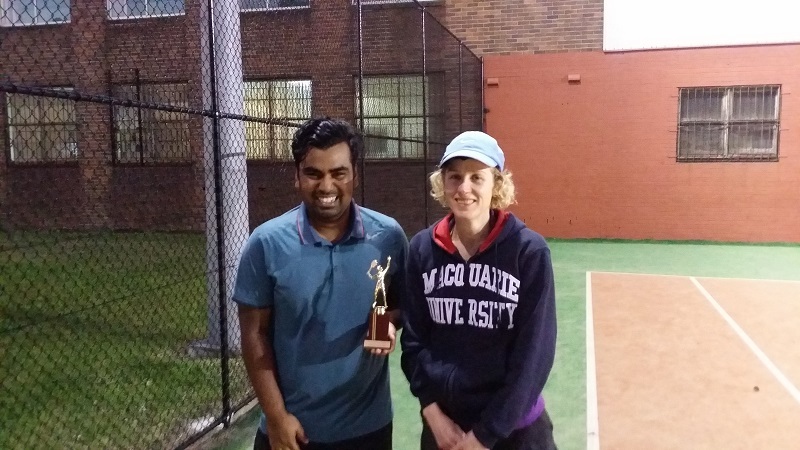 Congratulations to all our participants in the Autumn Adults Tennis Tournament.